A day after the Supreme Court restrained him from interfering with the process of selection of civil judges initiated by the Chief Justice of the Madras High Court, Justice C S Karnan of the Madras High Court ignited a new controversy by directing the CBI to inquire into the educational qualifications of fellow judge of the Madras High Court, Justice V Dhanapalan. He had earlier initiated suo motu proceedings and passed an order questioning Justice Dhanapalan's inclusion in the committee to interview candidates for selection as civil judges and stayed the recruitment process. In a letter addressed to the joint director of CBI in Chennai, copies of which were circulated to media on Tuesday, Justice Karnan directed the investigating agency to submit the inquiry report within three months. The said judge, alleged Justice Karnan, produced BL degree certificate claiming that he studied in a regular course as day scholar from 1980-83, that he obtained a masters degree in law from the Madras University in 1985-87 and that he had enrolled as an advocate at the Bar Council of Tamil Nadu in 1983. He claimed that Justice Dhanapalan was working in the post and telegraph department as a permanent telegraphist between August 3, 1976, and November 30, 1988. This meant he had "produced bogus certificate and obtained the position of judge at Madras high court," the letter said. He furnished a copy of the employment details of Justice Dhanapalan (obtained through RTI) and the copy of 'vakalath' filed by Justice Dhanapalan in the high court, along with the letter. These details were also available on the files of the Bar Council of Tamil Nadu, University of Madras, Dr Ambedkar Law College and post and telegraph department, the letter said. Justice Karnan directed the CBI to conduct an inquiry to "prove the case before the Supreme Court". "This direction is given only to extend full cooperation with the order of the Supreme Court in order to disclose the entire factual position of the case," the letter said. The principal of Dr Ambedkar Government Law College, Tamil Nadu Bar Council, Madras University Registrar, chief general manager of Chennai Telephones and the Registrar General of the High Court were sent copies of the letter, requesting them to cooperate with the CBI for a thorough inquiry. Earlier, after his April 16 order interfering with the judge recruitment process was stayed by a division bench of the high court on April 17, Justice Karnan had sought to initiate contempt of court proceedings against Madras High Court Chief Justice Sanjay K Kaul, accusing him of interfering in his judicial work. 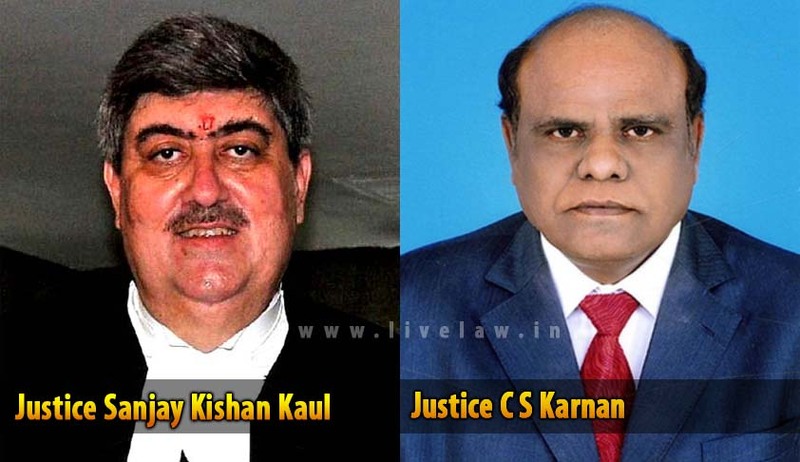 Justice Karnan also threatened to direct National SC/ST Commission to initiate a detailed inquiry against Justice Kaul for allegedly harassing him. It was then that the High Court Registry immediately moved the Supreme seeking a stay of the orders passed by Justice Karnan. On Monday, a three-judge bench headed by Chief Justice of India H L Dattu passed an order directing Justice Karnan to keep off the civil judge recruitment process and restrained him from proceeding further with the matter.